Download a blank fillable Dd Form 2826 - Trustee Report in PDF format just by clicking the "DOWNLOAD PDF" button. Complete Dd Form 2826 - Trustee Report with your personal data - all interactive fields are highlighted in places where you should type, access drop-down lists or select multiple-choice options. AUTHORITY: 37 USC Chapter 11; EO 9397. 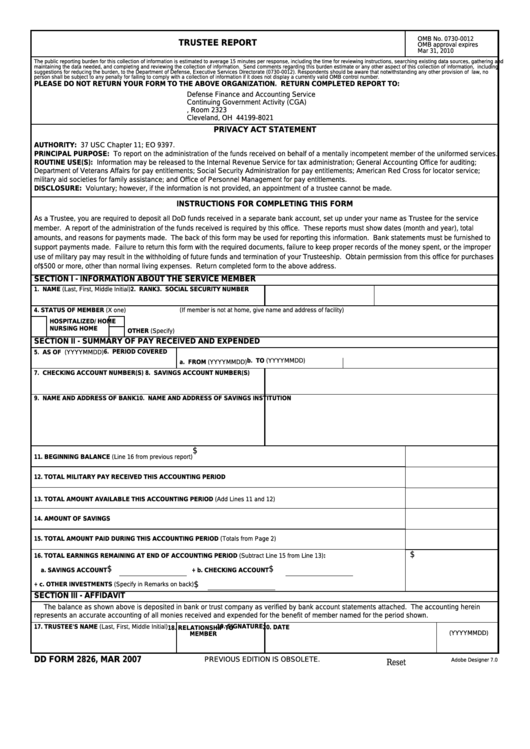 PRINCIPAL PURPOSE: To report on the administration of the funds received on behalf of a mentally incompetent member of the uniformed services. military aid societies for family assistance; and Office of Personnel Management for pay entitlements. DISCLOSURE: Voluntary; however, if the information is not provided, an appointment of a trustee cannot be made. of$500 or more, other than normal living expenses. Return completed form to the above address. represents an accurate accounting of all monies received and expended for the benefit of member named for the period shown.